The beautiful and peaceful Anacsotia River. Our coach this year is Cindy Cole, who has participated in rowing for 30 years. She has 19 years of coaching experience, and 12 years of boat club management. Most recently, she was Program Director and Coach, 1994-1999, at the Potomac Boat Club, for the Masters Women’s Sweep Program. She led a crew of 30 athletes to championships at local, regional and national competitions. 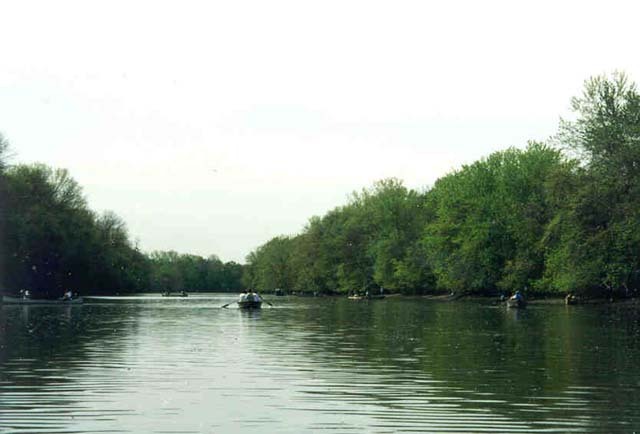 (Head of the Charles: women’s masters 8- 1st place 1995, 1997; Head of the Schuylkill: women’s masters 8s- 1st places 1995-1999; Head of the Potomac: women’s club 8- 1st place 1999, women’s masters 8- 1st place 1995-1999.) Read more about Coach Cindy...(RTF doc). Practice site will be again be the beautiful Bladensburg Historic Waterfront Park. Practices were held at the Bladensburg Waterfront Park. Practices were held at Bladensburg Waterfront Park, Tuesday-Friday, 3:00 p.m -5:00 p.m., and Saturday 9:00-12:00 p.m.
We rented equipment from the University of Maryland Men's Crew Club. Our coach was Kevin Bryan Gannon, president of the UMD Mens' Crew Club.